Bangkok (Thailand) – March 5, 2018 (travelindex.com) – Outbound travel from Thailand is set to hit 10 million this year, according to the first comprehensive market research report on what is expected to be the “The Next Big Thing” in Asia-Pacific tourism. 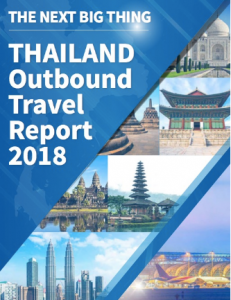 Designed to help destinations worldwide better understand the dynamics and drivers of this promising source of business, the report says that outbound travel from Thailand, including both Thai citizens and the thousands of middle-upper income expatriates, hit 8.2 million trips in 2016, almost double the 2011 figure. It is projected to have crossed 9 million in 2017 and is heading for 10 million in 2018, assuming that the global, regional and local geopolitical/economic situation remains stable. Compiled and researched by Imtiaz Muqbil, Executive Editor of Travel Impact Newswire, and one of the longest serving travel industry journalists in the Asia-Pacific, the study is available for sale through a variety of dynamic pricing options. Interested parties can email imtiaz@travel-impact-newswire.com. The report also notes the big gap between the number of airlines flying to Thailand (118 as of the winter 2017/2018 airline schedule) and the number of foreign NTOs having full-time or marketing representative offices in Thailand (only 12). A handful of other countries have separate arrangements such as through appointed GSAs. It also notes the enormous promise of road travel as the completion of the Asian Highway allows Thailand to take full advantage of its unique geographical location at the heart of the ASEAN region, with strong overland connectivity to Myanmar, Laos, Cambodia and Malaysia.